Hi everyone !!!! I'm glad to be part of the radio show France In The Mix 3 a 24 hours non-stop radio show broadcasted on Afterhours.fm bringing on together the largest trance french producers and dj. The full lineup and timetable has just been announced on http://www.franceinthemix.com so catch me Monday March 29 2010 -> 5 PM (CET Time) on afterhours.fm ! Subscribe and invite your friends to the facebook France In The Mix 3 event ! Hi everyone. 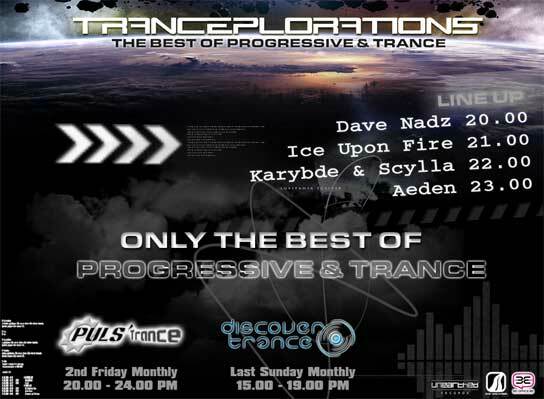 A new épisode of tranceplorations is coming, i've got for you my favorite tracks of the moment: le last remix of ariwave, the new ferry tayle & static blue and the new karybde & scylla, discover also the last mashup of Dephasys ! As usual i've prepared for you the lastest pure uplifting releases so tune in at 8pm GMT (9PM CET). Hi everyone. A new épisode of tranceplorations is coming, this month i've prepared for you a powerfull mix with hot stuff progressive and uplifting. You'll also discover my new production "Mind Stories" so tune in ! Hi everyone. HAPPYYYY NEWW YEAARRR Welcome in 2010 with a new episode of tranceplorations, this month lots of powerfull trance music so as usual we are waiting for you tuned in ! Hi everyone !! The last episode of 2009 is dedicated to tbird, tranceplorations brings you losts of exclusive tracks (father christmas HoHOho ;-)) so dont miss the radio show (check the upcoming dates) !! As usual dont forget to send me a comment to vote for your favorite tune of the month. 09 - Dash Berlin feat Emma Hewitt - Waiting (Sean Tyas Remix) Tune of the month ! 10 - RAM - RAMsterdam (Jorn van Deynhoven Remix) Your favorite track ! Send me a comment to vote for your favorite tune of the month. I am very happy to participate to the radio show "Nightwaves" of spacewalker as a guest !!! Catch me saturday, October 24 on pulsradio trance 10pm for 2 hours of pure mix !!! 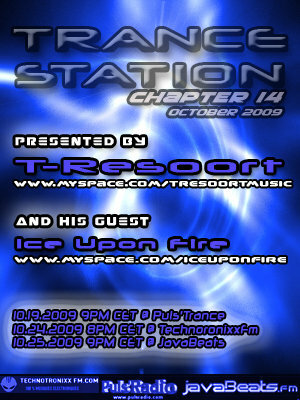 As early as monday catch me on the T-Resoort's radio show called "Trance Station" for a special guest mix with lots of news, exclusive and pure uplifting trance tracks! Schedule: check the dates page. Let's go for a new episode of tranceplorations !